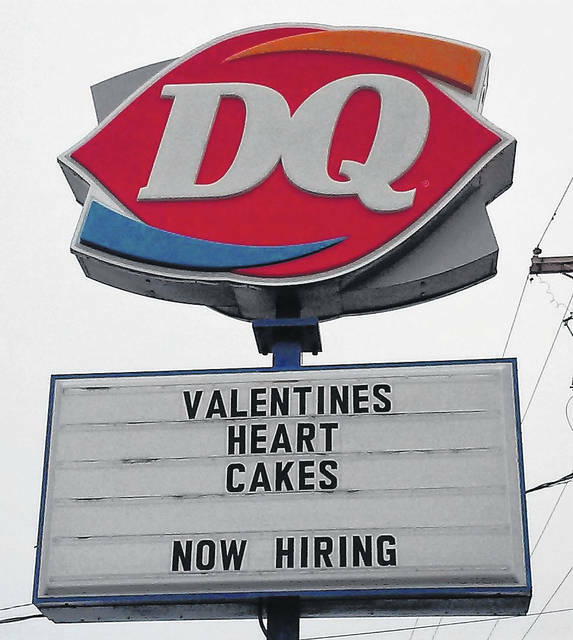 The Hillsboro Dairy Queen, opening Friday, advertises a seasonal special and job opportunities. As Highland County slowly comes out of the deep freeze this weekend, forecasters are predicting spring-like temperatures in the coming week — and another reminder of warmer weather to come is the Friday opening of the Hillsboro Dairy Queen, which is celebrating 69 years in business. Shift lead Samantha Hall told The Times-Gazette that the ice cream shop will be serving frozen treats on Friday from 11 a.m. until 9 p.m.
Hall said Dairy Queen will be featuring new products and specials in the coming year, including Cupid heart cakes for Valentine’s Day and a Free Cone Day in March. For opening day, the ice cream shop will feature Ghirardelli chocolate dipped blizzards, Hall said, adding that the treat is her personal favorite because of the rich chocolate and creamy flavor. “What girl doesn’t like chocolate?” she said. Operating hours for the Hillsboro Dairy Queen are Monday through Saturday, 11 a.m. to 9 p.m., and Sunday from noon to 9 p.m. The Hillsboro Dairy Queen is located at 980 W. Main St. (U.S. Route 50).